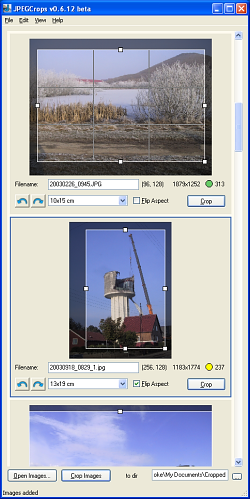 JPEGCrops is a Windows program, created for preparation of a batch of images for printing. It provides lossless cropping with fixed aspects using jpegtran. The program is freeware for private use and is localized to danish, english, finnish, german, polish, portuguese, galician and japanese. Partly localized to czech, dutch, french, hungarian and italian. Note: If you came here looking for Jpegcrop, then you're in the wrong place. Please visit the Jpegcrop page instead. Jpegcrop and JPEGCrops are two different programs. News (2010-02-16): I have not answered JPEGCrops-related email for a long time. Bad boy me. I made a page on the subject, so go take a look at the explanation for this.